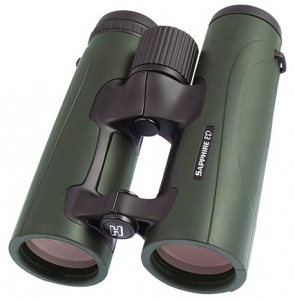 The Sapphire® ED binoculars feature a high performance optical system with dielectric prism coatings – giving the user the brightest image reproduction possible. The ED glass eliminates Chromatic Aberration. This incredible optical performance is housed in a magnesium alloy open hinge design while the exterior design and function have not been over looked. Incorporated is a quick ratio (1.7 turn) focus knob, low profile multi-stage twist-up eye cups and stay-on lens covers. Available in black or green, the highly tactile, performance rubber armour has been designed to allow for comfort, yet provide excellent grip.The Sapphire® ED is supplied with a comfort neck strap and a genuine leather hard case.